Don’t you love recipes that can be served any time of the year and that always make people swoon? Fruit Pizza is one of those recipes. I see this dessert/appetizer/party food at summer parties just as often as I see them at holiday gatherings. Baked Apples are one of the many foods that make me think of my mom. One of her signature meals growing up was pan-fried pork chops with baked apples and a crisp Green Salad. If there were ever leftover apples, I'd bring a fork to the fridge and enjoy them cold. Woooo-weeee! It is prime season for the delicious pomegranate! Seeing them stacked a mile high in the produce section makes me giddy. I couldn't resist grabbing a few of them out of the bin last week. I didn't have a recipe plan, but that's the good thing about pomegranates. My eyes are burning! Thank goodness for the cup of coffee that sides to my right. Buddy has been awake since 5:00 and my cutie boys were eager to start the day shortly after that. Before 8:00 a.m. we: had breakfast, did a load of laundry, had an adventure at the..
We got a thick blanket of snow overnight and I am loving it. I might sing a different tune a few months from now, but it's so pretty out there and the cold is exhilarating. I promised my boys some snow play time after school today, so I am getting geared up for forts and snowmen! This week has had a sad undertone. It was my last week spent just with Sammy before kindergarten begins. I threw in a few extra special things for us to enjoy together that I will carry with me forever. I will miss so many things next year! My huge stash of apples is gone and I'm sad. I miss them. I miss using my awesome new apple peeler. Have I mentioned how I came about a large stash of apples? This is going to sound made up, but I promise it's true. My friend Monica can vouch for me because she is the one who gave me access to 500 apple trees that have barely been touched. We are on the tail end of our 2014 summer road trip. In all honesty, it has not been an easy adventure. Elijah is struggling more than ever. The (un)perfect storm has been brewing in his little mind/body, making him act in ways I have never seen. If I had known this scenario would have transpired, I never would have left Minnesota. Despite the hood being ripped off my car for no apparent reason on the interstate, I am determined to make our upcoming road trip happen. Seriously, who does this happen to? Have you ever heard of a hood just flying off of a car? At any rate, the little boys and I plan to head toward the east coast starting on Friday. Before I get to the winner of the $25, t-shirt and other goodies, I have to tell you that I am disappointed in myself for not sharing this smoothie with you sooner. It's one that I make regularly. Almost daily in the summers. It is fantastic, versatile, healthy and packed with total good-ness. My sweet oldest boy was sent home early from school two days last week due to an icky tummy. We cannot figure out why his stomach (seemingly) randomly becomes so upset. We have removed so many of the "bad" things from his diet, so what else could it be? Commence the time of year when Dan is wrapping up his crazy summer work while I simultaneously begin my crazy fall work. We call this our craaaazy transition time. This year we can stack onto that having a six-year-old who is adjusting to full-time school, which is actually going better than I ever could have imagined. This lemon buttercream frosting is incredibly light and delicious. Finger-licking recommended! I have a great weakness for frosting. Whether it adorns a cake or a cupcake or a spoon or my finger, I do not care. Consisting mainly of that ingredient I love so much called sugar, it is one of the foods I have a very hard time resisting. This lemon buttercream frosting is incredibly light and delicious. It went great with the three-layer lemon cake I recently made, and it would be a good topping for a number of other baked goods, as well. Add 3 1/2 cups of confectioners' sugar in batches and beat until light and fluffy. Add 3 tablespoons of fresh lemon juice and beat for 1 more minute. Don't allow your three-year-old to try a sample or you will risk losing half the batch. It's finger-lickin' good! Incredibly light and delicious! In a medium bow, beat the following ingredients with an electric mixer on medium speed until light and fluffy: 1 cup softened butter and 2 tablespoons lemon zest. Add 3 1/2 cups of confectioners' sugar in batches and beat until light and fluffy. Add 3 tablespoons of fresh lemon juice and beat for 1 minute. A festive sparkling drink, great for toasting in the new year! 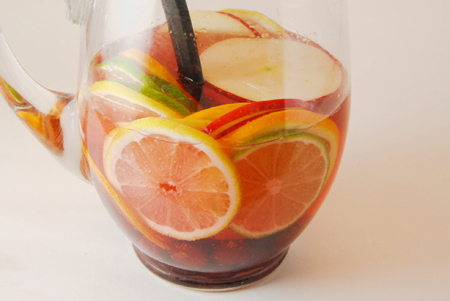 Mixed together quickly with fresh fruit making this sangria so light and ready to serve in minutes. 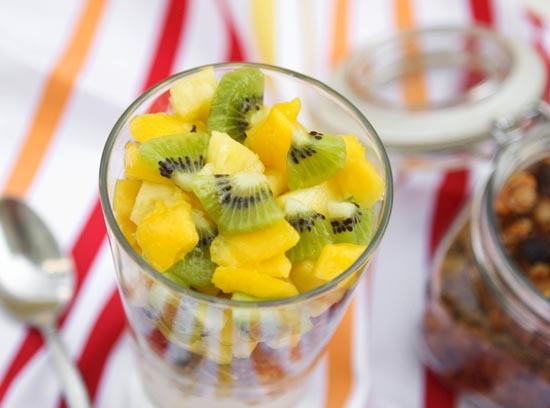 So simple, yet so refreshingly tasty! My husband and I love hosting parties. It is such fun to make a ton of food and create a fun, safe environment for friends for an evening. Since we've had kids, our gatherings have become much more low-key, much smaller and much less frequent. We hadn't had people over for an official gathering since well before I was pregnant with Samson, a year and a half ago. So, to slowly get ourselves back into the hosting scene, we decided to have a few people over for New Year's Eve. Just a few. We made it super low-key because we had just gotten home from our vacation in North Carolina the day before. I'm already planning a bigger gathering in my head. One involving a lot of cooking, Ebby and hungry friends. Anyway, back to New Year's Eve. I wanted to make a festive drink to go with our spread of food that we could toast to the new year with! Except, it didn't last until 2011. It was tasty, though! And so pretty. 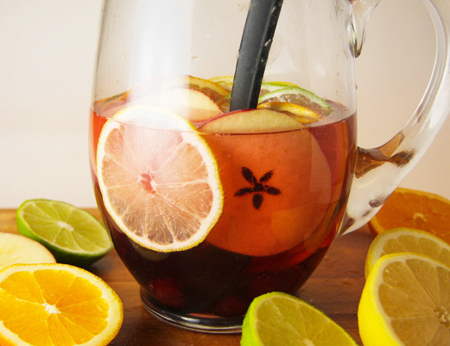 Throw everything into a pitcher, mix, and pour into champagne flutes. 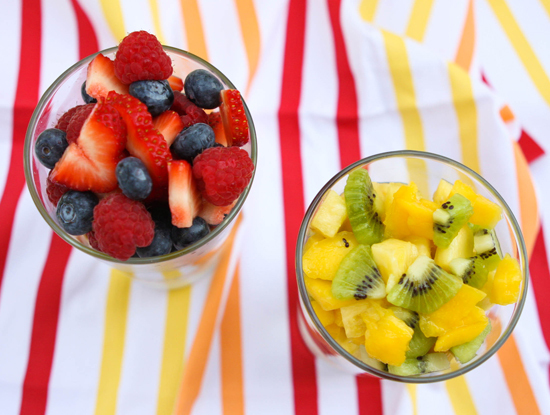 So simple, yet so refreshingly tasty! Happy New Year! For a summer take on a sangria try my Watermelon Raspberry Sangria. It's fruity, it's bubbly and it's refreshing! A festive sparkling drink, great for toasting in the new year! 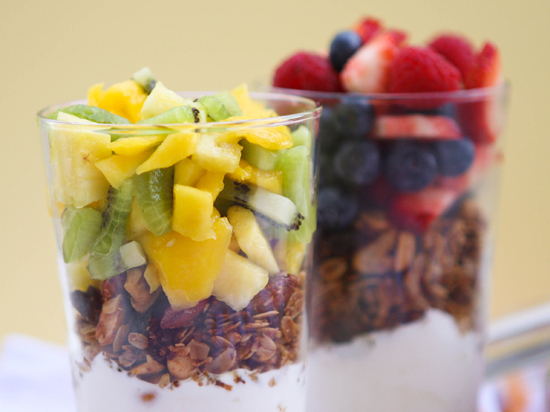 So simple, yet so refreshingly tasty! Throw everything into a pitcher, mix and serve!